The explanation of internet blackjack basics accessible even to novices. Description of main peculiarities of the game and its bets. More and more people all over the world can't imagine their lives without playing computer games. 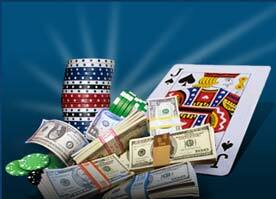 Nowadays the tradition of playing internet casino games becomes very popular. Internet Blackjack is almost the same as land casino blackjack. Their rules are almost the same. The aim of a game is to beat the banker by getting 21 score or close without exceeding it. Blackjack games pay 1.5 to 1, the other wagers are even money. Mane casinos play bonuses for both Ace and Jack of spades and three 7s hand. Online casino blackjack has a new deck of cards on every dealt hand. 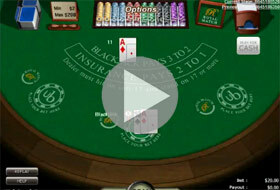 In both blackjack variants it is allowed to take insurance or double down, split Aces. In some land casinos it is not allowed to re-split paired cards. To play online casino games you should download blackjack or other games on your computer. It is better to practice card counting in land casinos, as in Internet blackjack games the banker deals new deck of cards in each game. Splitting. The player has the right to split two first paired cards of equal value. Than he/she places two equal wagers with the same value and plays two separate hands. The gamblers can draw additional cards to beat the dealer on each hand. Double Down. The player has an opportunity to double his bet after the receiving of two first cards. After doubling it is possible to get only one additional card. Insurance. It is a side bet. Allowed when the banker has an Ace showing. The player can bet up to the half of his/her original wager and get payment 2:1 if the dealer has a blackjack. Surrender. You are allowed to pay half of the bet and not to play the hand out.